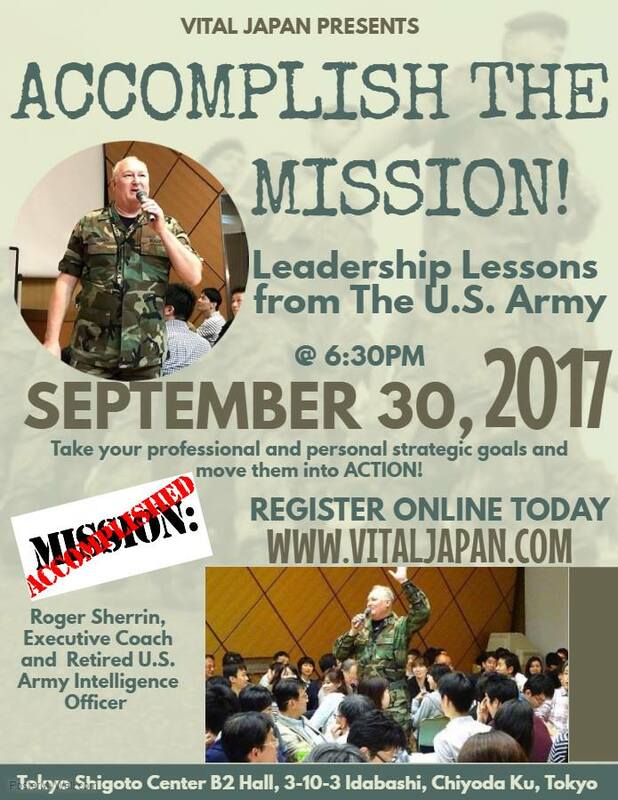 Executive Coach Roger Sherrin returns to Vital Japan to share more personal and formal leadership lessons from his experience as a U.S. Army Officer. In previous Vital Japan sessions we designed your Personal Strategic Plan to target the professional and personal goals you want for your life – in this Vital Japan we will learn how to “Accomplish the Mission”. Your ‘Mission’ is making your future goals a reality and give direction to your daily actions. Goals without Action are just wishes! Learn how to move your Strategic Goals into a Mission Plan and move into Action! Learn how to “Adjust Fire on Target” when things change in life. And learn Roger’s “4-Action Steps” to overcome obstacles, concerns, or overwhelm! These simple steps can move you into working toward your Mission or goals immediately. Bring your Personal Strategic Plan, or a few personal & professional goals you want to accomplish this year! Roger Sherrin is an Executive Coach specializing in Global Professional coaching and leadership development. During his 27 years as a United States Army Officer, Roger served as a Military Intelligence specialist, East Asia & Japan Regional Analyst, and Counter-Terrorism Analyst in international assignments. Roger holds an M.B.A. from Hitotsubashi University and London Business School, and a degree in Psychology & Japanese Studies, bringing a unique cross-cultural perspective to personal development. Coach Roger specializes in working with Global Professionals like Vital Japan members in creating a personal strategy to make your career and life goals a reality. He is a Board Certified Coach, an International Coach Federation Associate Certified Coach, and member of the Foreign Correspondent’s Club of Japan. *Sign Up Form Sign UP Now! Please join us for our interactive workshop with Executive Coach Roger Sherrin.